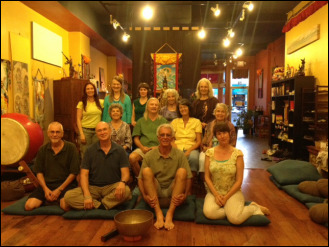 We offer a Weekly Meditation Service at the Center for Art & Spirit at St. George (1 School Road in Asheville NC 28806). Unless we are having a special event, our general weekly schedule is below. The 1st Tuesday of the month is Silent Night. We practice a guided sitting meditation, followed by a walking meditation (indoors or out), finished with a 20-25 minute silent sitting. Everyone is encouraged to practice Noble Silence, and if necessary to speak with a Dharma friend, please do so outside of the sanctuary space. The 2nd Tuesday we have our usual silent sitting meditation (about 25 mins.) followed by slow walking meditation, followed by whatever the facilitator chooses for that evening - usually a reading from Thay or one of his Dharma Teachers. We often then have time for Dharma sharing. The 3rd Tuesday after our silent sit and walking meditation, we usually recite and share the Five Mindfulness Trainings. On a quarterly basis though, we do the whole Recitation Ceremony for the 14 Mindfulness Trainings. The 4th Tuesday we have our usual silent sitting meditation (about 25 mins.) followed by slow walking meditation, followed by whatever the facilitator chooses for that evening - usually a reading from Thay or one of his Dharma Teachers. We often then have time for Dharma sharing. The 5th Tuesday is Creative Night, in which we may do something a little different than usual, but still within our Plum Village practice tradition.